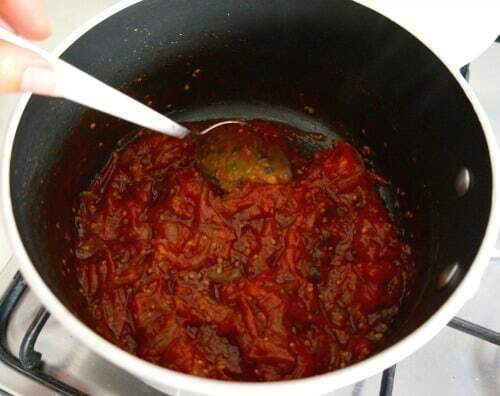 Old Fashioned Tomato Relish! (GF) - Sparkles in the Everyday! 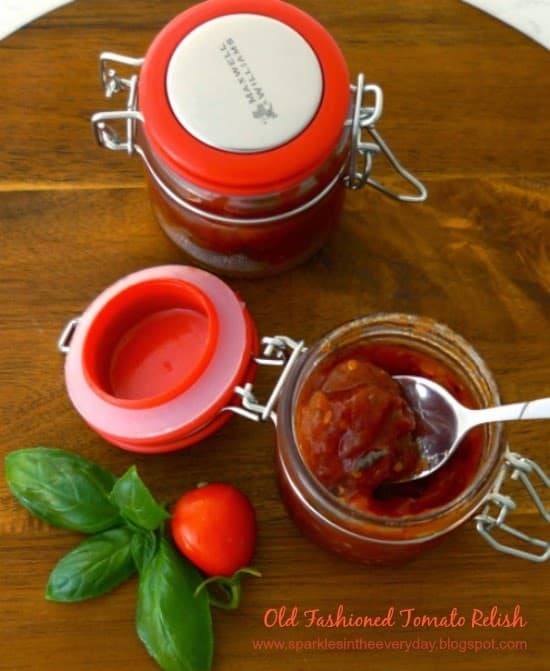 This Tomato Relish recipe is full of deep, caramel flavours – a true old fashioned flavoured tomato relish that is delicious, easy to make and gluten free! 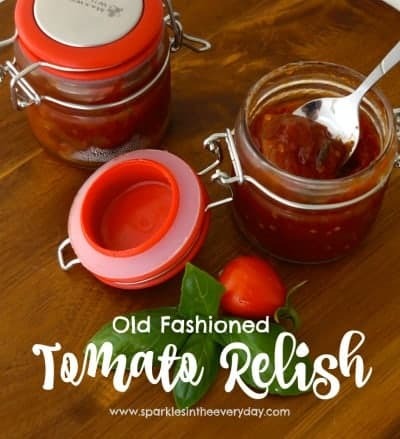 This ‘Old Fashioned’ Tomato Relish is not like ‘shop bought’ tomato sauce…This Tomato Relish is thick, tangy, has a caramel flavour and is perfect on hamburgers, with crusty toasted bread and with crispy wedges…. it is really easy to make and gluten-free! My son grows tomatoes in his home garden and he grows them well! He grows them so well that we always have too many, even after we have given some away. So, together we make our famous (well in our family anyway 😉 Old Fashioned Tomato Relish! This Tomato Relish has the taste of the ‘olden days’ when vegetables were homegrown, sweet and full-bodied. 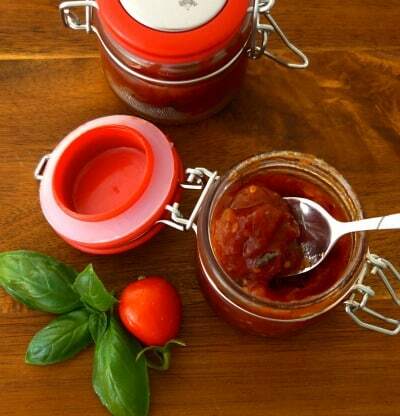 The best part is that this Tomato Relish can be stored in a sealed jar in the fridge for up to 4 weeks…perfect for when you need to slather it on BBQ meat, top chicken or even on the side with fish! …and it is gluten free!! 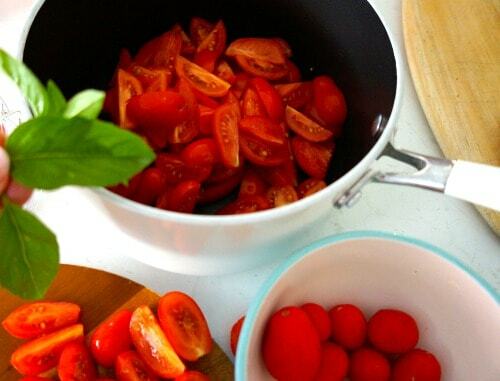 Recipe for Old Fashioned Tomato Relish – Gluten Free! Tip – If you wanted your Tomato Relish to have a little bit of extra ‘kick’ you could add chilli or dried chilli flakes if you like it hot! 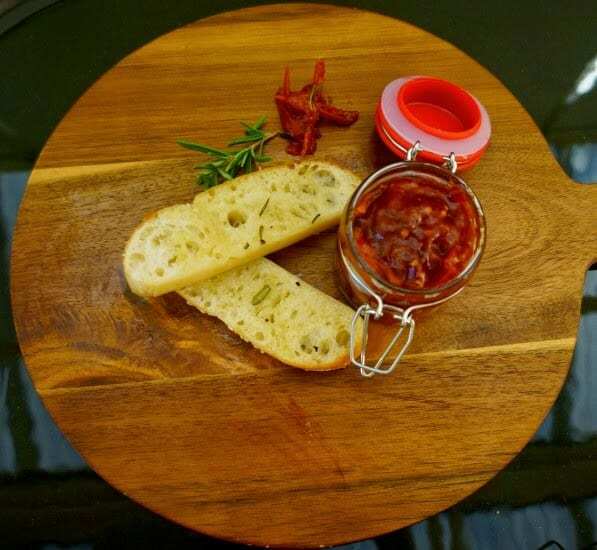 The Tomato Relish is easy to make and it is simply a matter of placing all the ingredients into a saucepan over medium heat and stirring to combine. Then bring them to the boil, while stirring.Turn down the heat to a medium heat and let the mixture simmer for about 20 mins. Then reduce the heat further and simmer for another 10 mins. Make sure you stir the mixture regularly. The mixture will start to thicken. Once this happens, then remove from the heat and allow the mixture to cool. 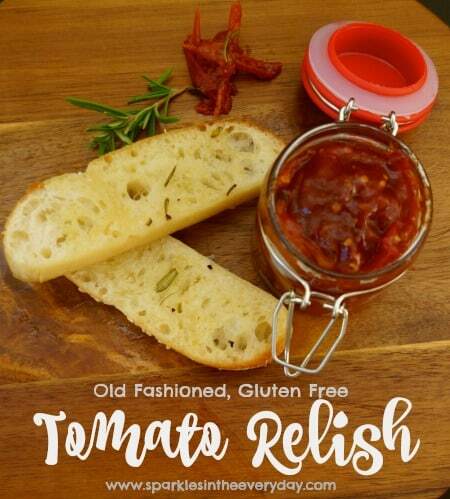 A delicious, full flavoured Tomato Relish that is gluten-free and perfect on hamburgers, steak or even smeared on fresh bread or crackers! 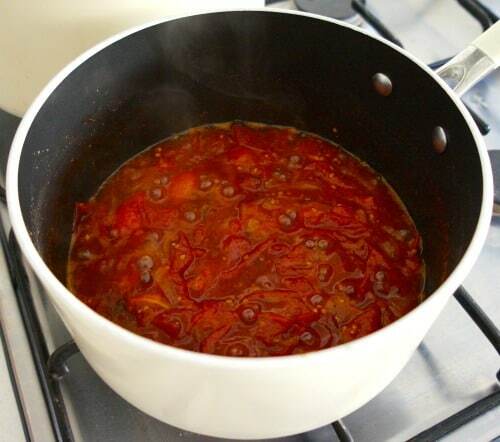 Place all the ingredients into a saucepan on medium heat and stir to combine. Bring them to the boil, while stirring. Turn down the heat to a medium heat and let the mixture simmer for about 20 mins. Then reduce the heat further and simmer for another 10 mins. Make sure you stir the mixture regularly. The mixture will start to thicken. Once this happens, then remove from the heat and allow the mixture to cool. Spoon into airtight containers and put them in the fridge. These little pots of relish are also great to take to work and leave in the staff fridge, when you need something special at lunchtime and mix the tomato relish through a salad or on top on toast. They are also the perfect gifts when you are stuck for an idea for a friend who has everything. « Easy Gluten Free Muffins with Orange and Chocolate! 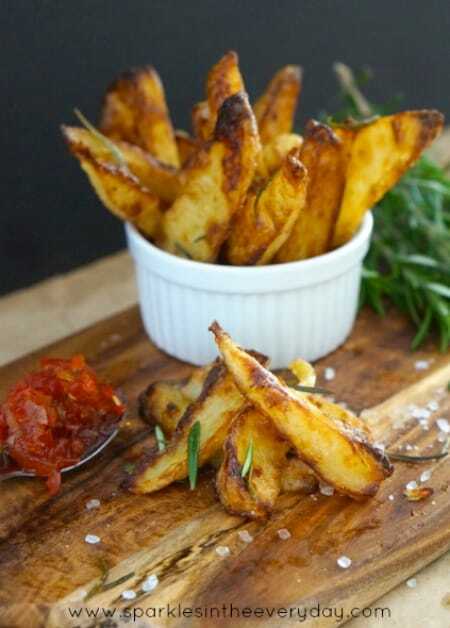 I love a good relish recipe and I love the look of the wedges too – Thanks for linking up to Pin Worthy Wednesday, I have pinned your post to the Pin Worthy Wednesday Pinterest Board. I really like tomatoes. I haven't heard of tomato relish before, but it looks delish! I just printed the recipe and I'm going to try it out this weekend. It sounds yummy with crusty baked bread!! My mom used to make this and it was always great. Thanks for the recipe, I've got to try it out. I never thought about making relish out of tomatoes, but I love this so much I had to pin and share. Followed you here from Friday Flash party, link up at Real Food Fridays.